Dos Chinos on Dos Wheels: Wastas + Abu Dhabi = ? Dos Chinos: Shu & Q as the Cubans called us. Dos Wheels: our motorcycle that takes us from Abu Dhabi, to South America, to Toronto, to Sweden, and to far and beyond. Wastas + Abu Dhabi = ? Wastas are "connections" in Arabic - they are about who you know to help make *things* happen. Think them as wheel teeth that keep the clocks ticking, and in the case of Abu Dhabi, often for free! These are what Wastas have got us during the past two days: Beyonce concert last night, F1 Grand Prix practice at the circuit this afternoon and Jamiroquai concert tonight - all for free! A little background on these F1 concerts - AD organizers made an interesting decision that they were only available to race pass holders, and not available for purchase by general public. It turned out for the Jamiroquai concert alone, a total of 15 friends/acquaintences attended mostly, if not all, without ever purchasing any race passes. Oh yeah, the arrangements were all quite last minute as well. So even though three days ago we didn't plan on having anything to do with Abu Dhabi F1, already we've been to three events at the fresh-paint-scented venue! 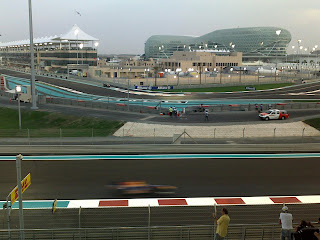 Yas F1 Circuit from West Grandstand-that's RedBull car racing across on the bottom there. 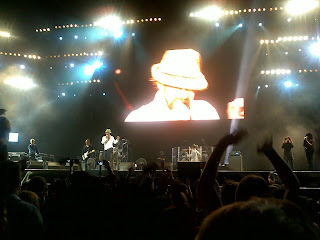 Jamiroquai was only 20 meters away! I don't think Q and I quite get the hang of this cultural phenomenon, but why should we even bother. Sometimes, it is easier to just go with the free flow.